Everbright Securities Co, Zunyi Titanium Co and Sichuan Expressway Co may be among the first companies to sell shares publicly as soon as the ban on initial public offerings (IPOs) is lifted. Everbright Securities, China's 11th biggest brokerage by assets, Zunyi Titanium and Sichuan Expressway are working on final documents required for regulatory approval to list in Shanghai or Shenzhen, Bloomberg reported yesterday, citing unnamed close sources. But the National Business Daily reported that Zunyi Titanium was virtually making no profit and its listing was likely to be delayed. Zunyi Titanium is China's largest producer of titanium sponge, the semi-processed material that is refined to make high-grade metal. The China Securities Regulatory Commission (CSRC), the country's securities watchdog, yesterday held an internal meeting, at which the officials said they would "keep a close eye on market sentiment" for resuming the IPO market. Industry analysts said the performance of the A-share market in the coming weeks would be an important reference point for the regulator. Last Friday, the country's benchmark Shanghai Composite Index declined about 1.91 percent on worries about the resumption of IPOs. On that day, market rumors said China State Construction Engineering Corp (CSCEC), the country's biggest home-builder, was likely to be the first company to go public. According to its pre-released prospectus, the company is expected to issue 12 billion A shares and raise about 40 billion yuan, making it the fifth largest IPO in the mainland ever. The officials who spoke at yesterday's meeting also said they were under "pressure" to resume the IPO market soon. Industry experts said China would try to ensure that the fresh equity inflow would not derail the stock market rebound. The CSRC in May said it would manage the pace of initial public offerings. "The regulator will take care of market sentiment and make sure investors can digest share sales. 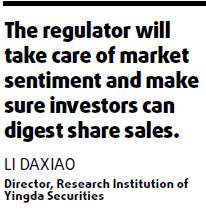 In my opinion, large companies are not likely to list immediately after the resumption of IPOs due to concerns that a massive equity supply could stifle the market rally," Li Daxiao, director with Research Institution of Yingda Securities. The CSRC stopped allowing public offerings in September after the Shanghai Composite Index fell almost 60 percent in the first nine months of last year. Thirty-two companies have passed hearings at the CSRC's listing panel, the penultimate step in the process of getting stock sale approvals. Those sales may collect a combined 70 billion yuan.